Precision agriculture and it’s associated tools have come a long way in the past 15 years. Everything from yield monitors to auto-steer to spray rate controllers. Despite some of the early equipment issues and complexities, efficiencies have been gained, inputs have been reduced and yields have increased. Yes, precision ag is coming of age. But have you ever considered how much specialized hardware and computing power is locked up in tractor cabs around the world? It can be more than a little frustrating to spend thousands of dollars on the latest technology only to have it permanently locked away in the tractor cab. Imagine if you could carry at least some of your precision farming system with you. What if you could monitor all of your farming activities live from wherever you are? What if you could access all of your farming history season-after-season in the palm of your hand? Well, you will soon! 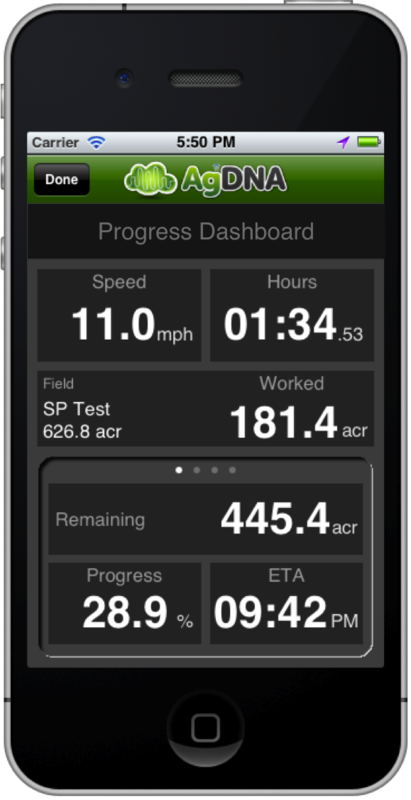 The AgDNA app for iPhone and iPad allows farmers and vehicle operators to track their in-field activities using GPS position. When wirelessly connected to the web, AgDNA automatically synchronises all location based job activities to the cloud in real-time without any additional hardware. So if you’re a grower, equipment operator or contractor now you can keep track of all your machinery activities. Track your location throughout the field and seamlessly store all of your records to the cloud for retrieval and viewing latter on. For farm managers and owners, now you can see all of your operators and equipment around the farm in real-time. See which machine is moving or stationary, where they are, the speed they’re travelling and the activity underway. No more guess work – make informed decisions based on real-time location data! AgDNA is a free app that empowers farmers and machinery operators of all shapes and sizes around the world to enjoy the benefits of mobile asset tracking and wireless data management. From large broad acre farming to horticulture, row cropping to turf management, hobby farming to roadside maintenance, AgDNA has you covered. The app is undergoing final testing and will be submitted to the app store in early 2013. To be one of the first to hear when the app is available to download, visit agdna.com and register for updates or follow us on Twitter @myagdna.